Since 1897, Cheyenne, Wyoming, has celebrated its Old West roots with this eye-popping festival. The centerpiece of this Western celebration is the world’s largest outdoor rodeo, which draws top professionals who compete for more than $1 million in cash and prizes. Complementing the daily rodeo action are behind-the-chutes tours, trick riding, and a wild-horse race. 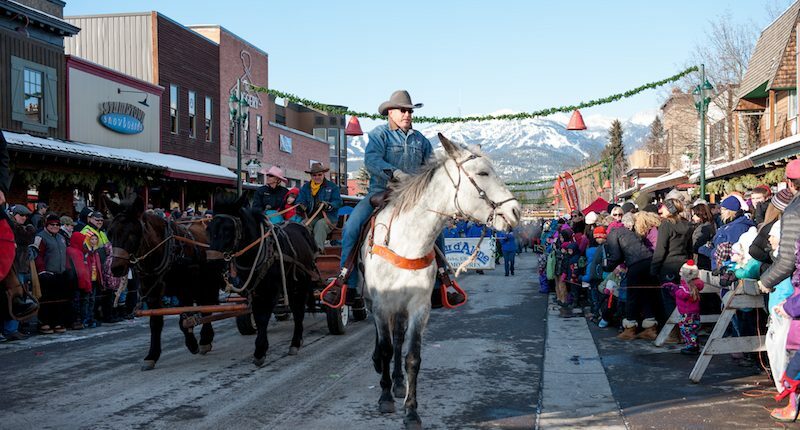 A Native American Village, an Old West town called “Wild Horse Gulch,” a saloon, square dancing, a chuck wagon cook-off, pancake breakfasts, and an art show carry through the frontier theme. 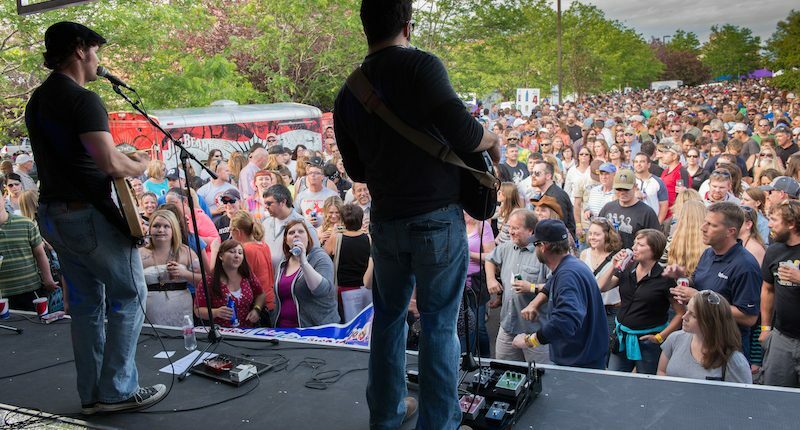 Rounding out the program are a carnival midway, an air show, top-name entertainment, professional bull riding shows, and several parades that include antique carriages and automobiles. 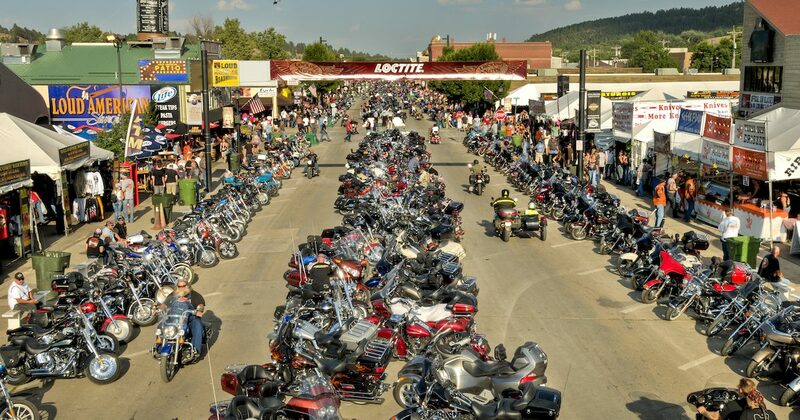 It’s Biker Heaven…Each year, Sturgis’ Main Street becomes a sea of motorcycles, leather and denim, not to mention, people. Since 1938, Sturgis has welcomed motorcycle enthusiasts from across the United States and around the world to the annual Motorcycle Rally. Based out of this small community in the northern Black Hills of South Dakota, the Rally is annual held the the first full week of August. Custer State Park in the beautiful Black Hills of western South Dakota is full of lush forests, quiet and serene meadows, and majestic mountains. This 71,000-acre state park is also home to one of the world’s largest publicly-owned bison herds, nearly 1,300 strong. Each fall, the ground rumbles and the dust flies as cowboys, cowgirls and park crews saddle up to bring in the thundering herd. The annual roundup, held on a Friday in late September or early October, is open to the public. 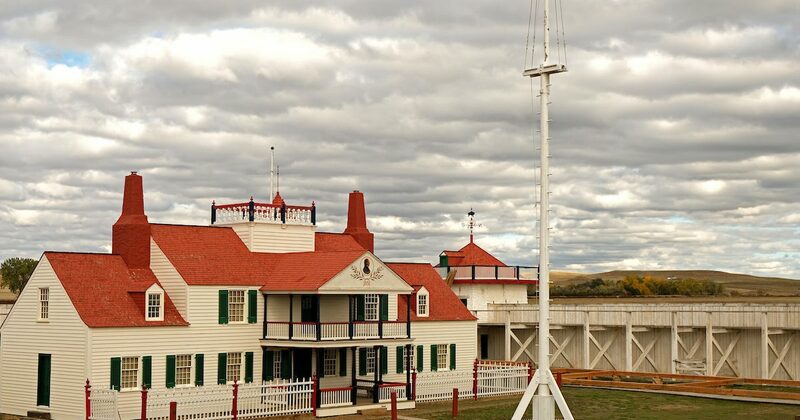 North Dakota has preserved several forts built in the 1800s to protect workers and settlers a westward expansion shifted into high gear. The most noticeable of these is Fort Abraham Lincoln near Mandan. This was the last home of Lt. Col. George Custer and much of the 7thCavalry, which rode west from here to the Little Bighorn. Many structures, including the Custer House and bastions on bluffs above the Missouri River remain. Virginia City was born with the discovery of gold in 1863 and became a boom town until the gold ran out. 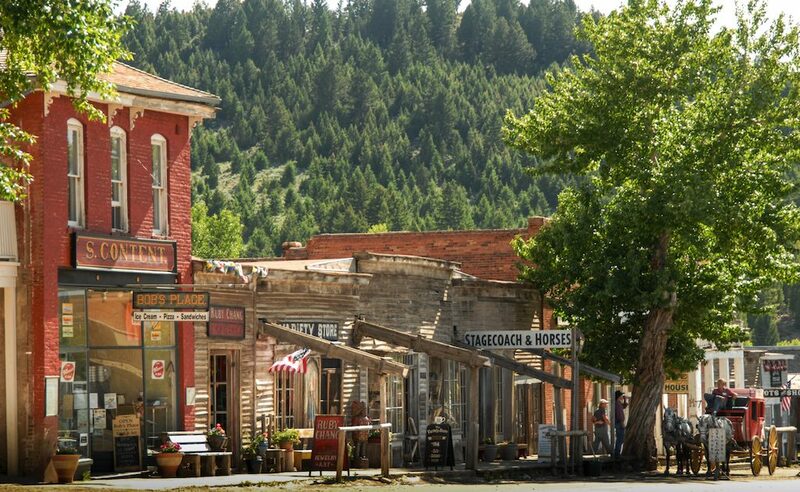 Nevada City lies just a mile away and is a western town created from a collection of buildings from other ghost towns. 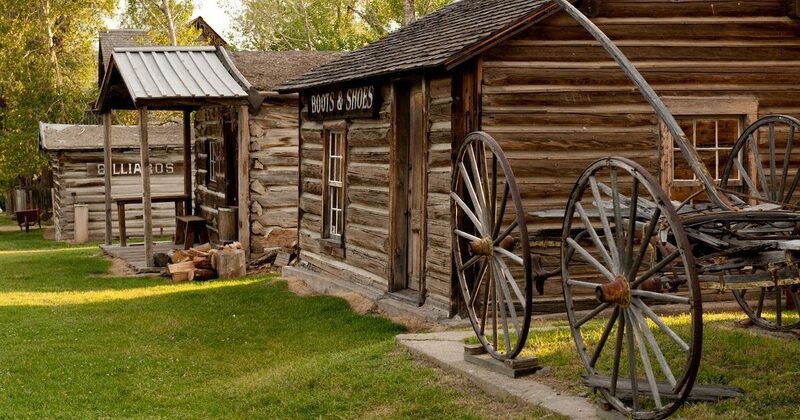 Both towns have been largely restored and preserved and have become living examples of the real Old West in Montana. 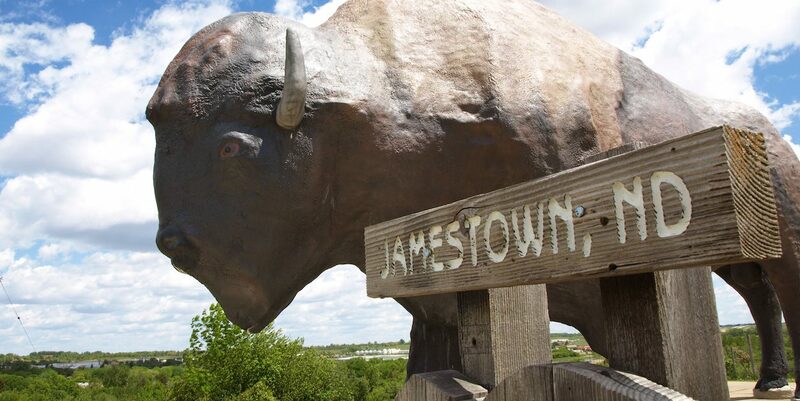 Take a step back in time at this re-created prairie town. Original buildings from the frontier villages of North Dakota have been moved to this site and filled with antiques and artifacts that bring the world of the prairie pioneers to life. The Village also features several shops selling handmade goods and souvenirs, light lunch and snacks at the General Store, an outdoor amphitheater with regular live entertainment, and stagecoach and pony rides. Cowboys hold Wild West-style shootouts every other Saturday from Memorial Day to Labor Day. The World’s Largest Buffalo Monument, National Buffalo Museum and live herd of Buffalo are also on site. 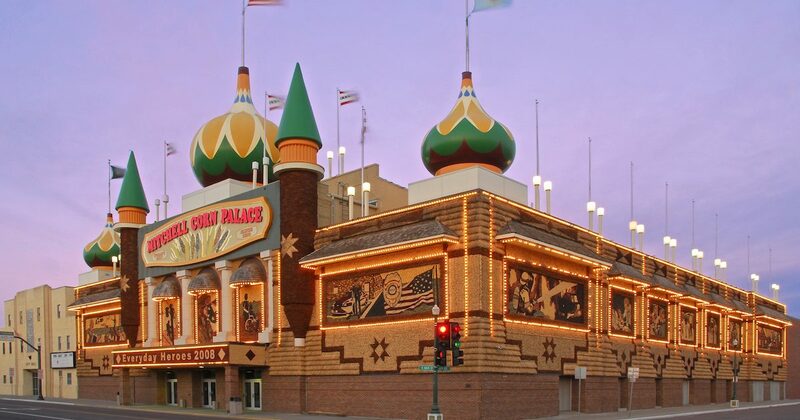 During the summer months the World’s Only Corn Palace in Mitchell, South Dakota, offers free-guided tours led by friendly guides full of a-maize-ing facts (like how many nails and staples are used in the decoration process). The tour also features an outstanding video explaining the Corn Palace story. After the tour you can view displays about the Corn Palace, watch murals being created, learn how the different colors of corn are grown, and shop for souvenirs in our large gift shop. 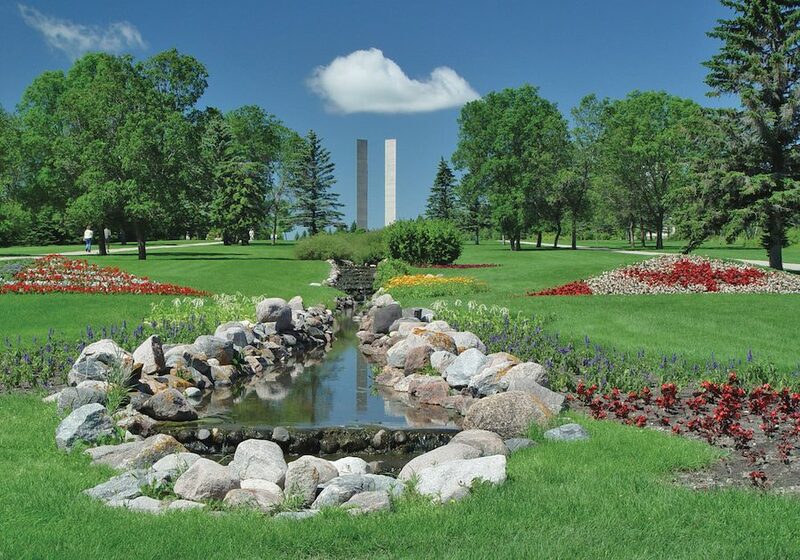 The International Peace Garden is a 2,339-acre botanical garden in North Dakota, commemorating peace between the United States and Canada along the world’s longest unfortified border. It blooms annually with more than 150,000 varieties of flowers and showcases the Peace Chapel. It is also home to the International Music Camp, Friday night concerts in June and July, and interpretive center, floral clock and souvenir shop. RV-friendly campground. A trip to De Smet, South Dakota, takes visitors to the homestead of famed author, Laura Ingalls Wilder. Explorers Meriwether Lewis and William Clark and the Corps of Discovery came up the Missouri River in 1804 looking for a route to the Pacific Ocean. By the time they got to the Washburn area in North Dakota it was obvious they needed a winter camp – and some friends. They built Fort Mandan, so named in honor of Native Americans living nearby at what is now Knife River Indian Villages. There they found a trapper named Charbonneau, whose young wife – Sakakawea – had knowledge of the lands west. She would prove valuable on the journey ahead. 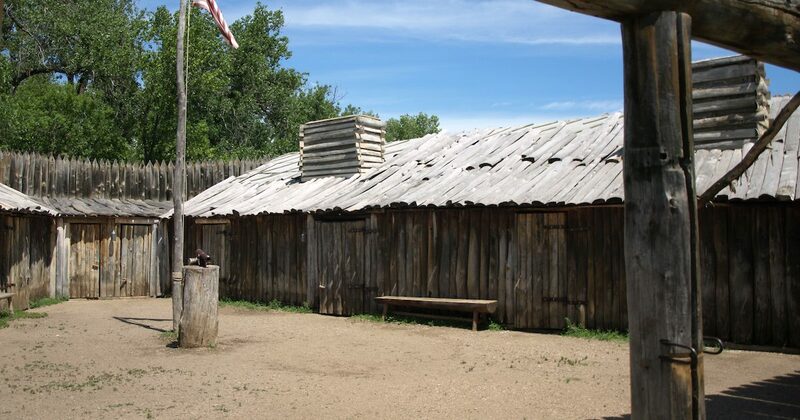 Fort Union was established as a fur trading post on the Upper Missouri river near what is now the North Dakota-Montana state line. Many tribes came to the fort to trade with the American Fur Company. This historic site, in Deer Lodge, Montana, commemorates the Western cattle industry from the 1850’s settlements through modern times. Situated in Once part of the largest cattle ranch in the US, it offers a living history program during summers, walking trails to explore, a ranch house to visit and Visitor Centre. Montana’s best-preserved ghost town and the site of Montana’s first major gold discovery, this state park has over 60 structures remaining, most of which you can wander through. 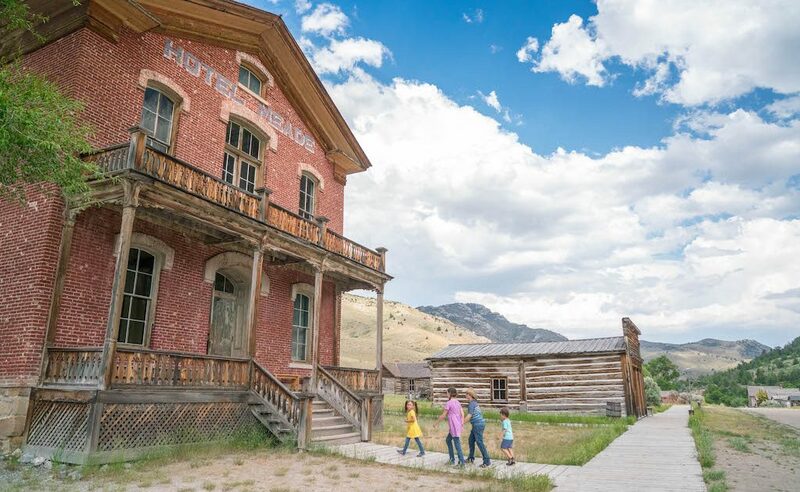 Summer offers Bannack Days and a living history program. Norsk Høstfest is a nonprofit Scandinavian Festival held annually in the fall in the N.D. State Fair Center on the North Dakota State Fairgrounds in Minot, N.D.. The late Chester Reiten and a group of friends who shared his interest in celebrating their Nordic heritage founded the festival in 1978. The festival has grown into North America’s largest Scandinavian festival with tens of thousands of people attending from all over the world. Located in the Silver Valley of Northern Idaho, Coeur d’Alene’s Old Mission State Park preserves a rich history of the Jesuit missionaries who settled in the area and their interactions with the local Coeur d’Alene Tribe. Home to the oldest standing building in Idaho, The Mission of the Sacred Heart has been preserved since its construction in 1848 using only mud, dowels and straw. Tour the Sacred Heart Mission church and Parish House, stroll the grounds to learn about how the missionaries and natives lived on the land and check out the visitor center to see the Sacred Encounters exhibit, which showcases the histories of the land and people. 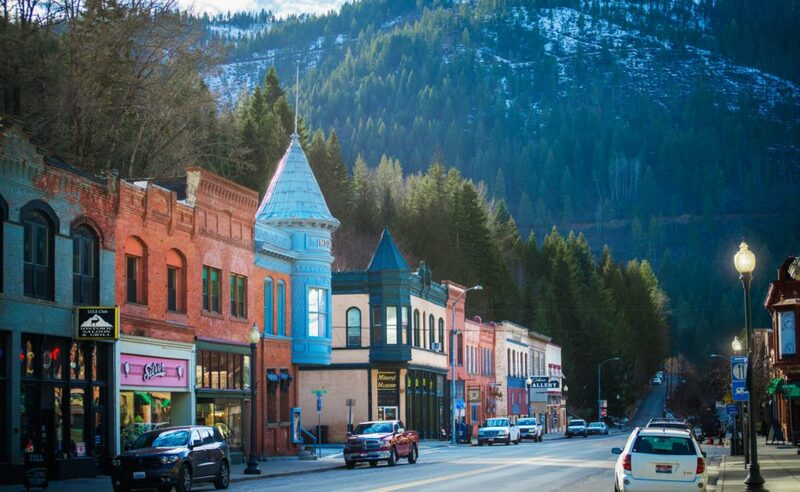 Known as the “Silver Capital of the World,” Wallace, Idaho and the surrounding area is the richest silver mining district in the world. Founded in 1884 after the discovery of silver lodes, the area blends wild west mining history with modern day techniques as it continues to produce silver and other metals. A town with a long history, bold personality and charm to spare, there’s plenty of quirky fun to be found during a stop in Wallace. In 2004, the town officially declared itself the Center of the Universe, because why not? The locals dare you to prove otherwise. The entire downtown of Wallace is also on the National Register of Historic Places, preserving a stretch of quaint and eccentric buildings ideal for wandering and exploring this unique destination. Jump on the Sierra Silver Mine Tour to hear stories from a hard-rock miner and witness how silver is extracted from underground, learn about the town’s history of bordellos at the Oasis Bordello Museum and enjoy a pint of local beer at Wallace Brewing.